Every morning, the first thing I do after I get dressed is put on my bluetooth headset. Rather then the Borgesque ear-dongle, I use a headset that goes around my neck, then only put the earbuds in when I get a call or want to listen to music (or white noise). I wear it all day, and frankly, I look like a complete dork. But until I can get an interface implant directly installed in my brain, it’s the next best thing. I was so pleased with my headset that when it started to fail, after about 10 months, I replaced it with the same brand. But when the next one started to have the same problem after about the same amount of time I decided to hunt for a different brand. I bought two different headsets, and now I’ll go into detail on all three of these headsets. I use an iPhone, not an Android or other mobile device. I assume these headsets work equally well on any device, but I did not test that. I will say that the Samsung headsets apparently have apps that provide access to additional functionality if you use a Samsung phone, including an equalizer, but I have no experience with that. I don’t include battery life in my reviews because all three have a nice long life. I never once ran low on battery. While I appreciate quality sound, I am not an audiophile. It’s difficult to assess sound quality on a headset because it needs to sound good when listening to music and also when listening to voice on a phone call, which have different spectral characteristics. Spoken voice is approximately in the 300-1000Hz range, but above and below that is just noise, whereas with music you want to hear the full range. If you have an equalizer so that you can use bandpass filtering to just pass the 300-1000Hz during phone calls, that would be best. I understand that the Android app available for the two Samsung headsets provide an equalizer, but this app is not available on the iPhone so I did not test this. Almost any of these “wearable” headsets have traded away some of their robustness in order to look unobtrusive when worn around the office all day. I’ve seen people reporting in reviews that thye’d broken their headset, and to them I say: You need to treat any headset gently! 1: Poor. 2: Merely adequate. 3: Average. 4. Pretty good. 5. Best. Note that my comments are all from the point of view of using these headsets in my office. If you are looking for a headset to use for working out, then your mileage may vary. Also note that there is a disparity in these reviews, in that I used the LG headset for almost two years, and I used the other two for only one day each. This was my first (and second) headset. 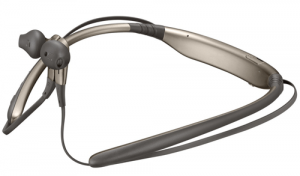 This unit is a collar at the neck with ample controls at both ends and retractable earbuds. Controls (5): The controls are on each end of the headset. On the left side you have a slider to control volume, and a button to answer/disconnect phone calls, or on a longer push will activate other phone features (on the iPhone, it activated Siri). On the right you have a slider to move to the next or previous track of your music, and a button to play or pause. The on/off switch is on the right side as well. 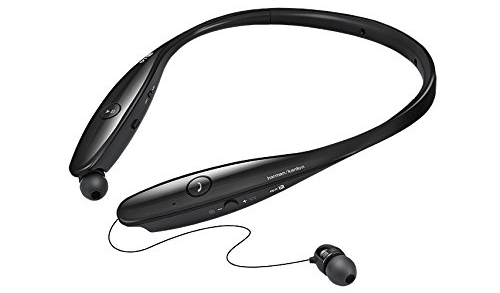 Sound (5): This headset boasts Harmon Kardon speakers in the earbuds, and I think the quality of the sound really comes through. From treble to bass, I was impressed by the sound when I listened to music. I also found this to be excellent for phone calls. Microphone (4): When I first got this headset in late 2014, I called several people from my expensive landline, and then called them back from my headset on my iPhone, and most said it sounded the same or nearly the same. Nobody ever reported issues with how I sounded on the phone, however I sometimes (inconsistently) found that for best results I had to direct my face toward the microphone (located near the phone controls on the left side of the headset). 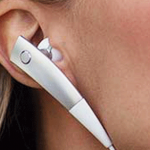 Earbud comfort (5): This headset uses rubbery plastic squishy earbuds that you push into your ear. I found them to be completely comfortable even when I went hours at a time with them in. 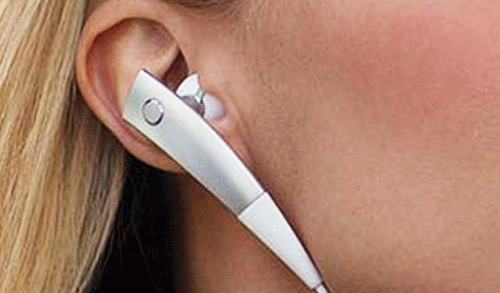 These earbuds are retractable so you never have them dangling (or tangling). 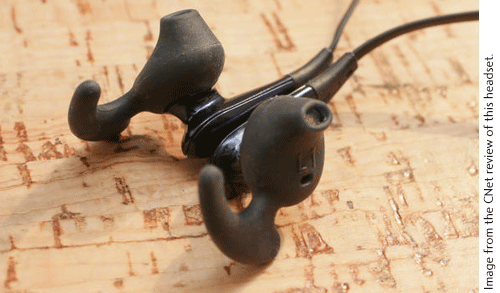 A push of a button on each end of the headset will retract the earbuds. Neck comfort (3): This is a full collar with one point of flexibility at the back. At 1.9 oz., this is the heaviest of the three headsets, but it is still very light around the neck. I found this to be completley comfortable for most of the day — but on very long days when I was still wearing them after about 10 hours, they would start to be mildly uncomfortable. My brother tried this one out and declared them to be uncomfortable for people with a large neck. 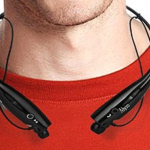 Appearance (3): Of the three headsets, this one is the bulkiest, so it stands out a bit more. I always referred to this as my dork-collar. The ends of the collar are are each 2 cm wide, 1 cm thick, and about 9 cm long. However the tradeoff is that, while the collar itself is bulkier, that meant there is no bulk at all up by the earbuds. Because there is absolutely no bulk at the earbuds and the wires are very thin, they are extremely unobtrusive in appearance. My first unit was black with red trim, and my second one was silver. If I got this one again, I’d go back to the black. Mechanics (3): The little cover over the charging port was easy for me to remove and replace without accidentally tearing off. However the wire to the earbud on the right side developed an intermittent short, most likely from repeatedly being retracted. I had the same problem on both my pairs of this headset. Also, on my second set, the controls on the right side started to wear out and intermittently not work. This goes around your neck just like the others, but it does not have a collar. Rather it is more like a wire that is sitting around your neck, and then when the earbuds are not in use, they have magnets to hold them together in front. Controls (4): By far the most minimal controls of the three headsets reviewed here. The on-off button in on the assembly next to the left earbud. On the right side assembly there is a single button that you push to play or pause your music, and to answer or disconnect a phone call. The volume control is also on the right earbud assembly in the form of a touch pad: drag your finger upward to turn the volume up, downward to turn it down. I was very skeptical at first, but now I find it to be quite useable and I like the fine level of control it provides. There is no control to advance to the next or previous track in your playlist, and I miss having that. Sound (4): I was surprised by how good the quality of my music was with this headset. It wasn’t quite as good as what I got with the LG, but it was still pretty good. However the sound when talking to someone on the phone was just average. Microphone (3): The sound quality of my voice was reported to be acceptable on this headset, but the person I talked to said that I sounded better on both of the other headsets I reviewed. Neck comfort (5): At exactly 1 oz. and with no real collar assembly, I find this to be very comfortable around my neck. People using this device when exercising report that this often falls off, but I’ve yet to have an issue wth that in my normal office environment. 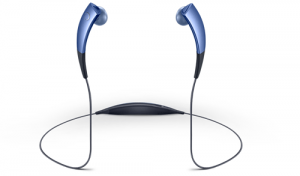 The product comes with clear plastic collar forms in 3 different sizes that you can use with the headset to help it stay on during exercise, but I didn’t bother with that. Appearance (4): I’m of two minds here. On the plus side, there is no collar, and I’ll have to get used to not looking like such a tech-dork! But they avoid the collar by putting the controls in 1-cm-wide assemblies up at the ear buds, so the bulk of the tech is merely moved up from your neck to your ears — moving a little closer to the Borg-look of the traditional one-ear bluetooth device. When your earbuds are not in use, they dangle in front and there are magnets to hold them together, either as a closed circle, or back-to-back. This is a nice, minimal headset that embraces a less-is-more philosophy. It is a thin, flexible collar with non-retrcting earbuds that magnetically connect in front when not in use. Controls (3): All the controls are on the right side of the headset, and there are only three buttons. The largest button nearest the end is to play/pause music and answer or disconnect the phone call. Then there are two small buttons to turn the volume up or down. I am a little disappointed in the incremental change when I use the volume controls: not very fine control. There are no controls to move through your music. While I would like to have a previous/next button, it is nice to have fewer buttons. After a few weeks using this unit, one thing I don’t like is that the controls for volume are two different buttons — so you have to carefully feel around to make sure you have the correct one. Worse yet, they are right next to the button that answers/disconnects calls… so I am sure I will accidentally hang up on people from time to time. Sound (3): I found the sound quality on this headset to be okay for music and phone calls. However I could tell that the spectral range of these speakers was not as nice as it was in the other two headsets: it seemed to lose some of the treble in music and there was just a little bit of a tinniness to the voice on a phone call. Even so, this isn’t so noticeable and unless you are an audiophile, I expect this doesn’t matter too much (to me, anyway). Microphone (5): Of the three headsets, the person I called said that my voice came through the best on this one. I am pretty mystified by this, as the microphone is located on the part of the band that is at the back of my neck! 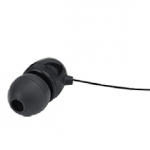 Earbud comfort (3): The style of earbud is a solid base with a rubbery squishy plastic cover, but it is not the kind that you fully put into your ear. I assume so as to improve their ability to stay in, they have an odd “anchor” assembly of the same rubbery material that nestles in your outer ear, which I found these to be just a little uncomfortable, but the box had replacement covers that exclude the anchor. Neck comfort (5): This was very comfortable. Although it is a full collar, it is very minimal and has two points of flexibility. This makes it a bit more comfortable and look a bit better than the LG Tune. Appearance (4): The ends of the collar are are each 0.75 cm wide and thick, and about 5,5 cm long. 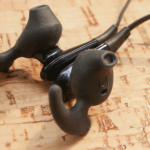 When the earbuds are in use, it is not terribly unobtrusive as there is a little bit of assembly at the earbuds (just about 0.75 x 3 cm) and the wires are a bit thick. Mechanics (5): The “anchor” assemblies on the earbuds made it take a second or two longer for me to put the earbuds in, which seems like forever when your phone is ringing. But remove the anchors and that’s not a big deal. The headset for you depends on your needs. If your main need is for listening to music, then you’ll want the LG Tone with its superior sound and greater control. However if you use them constantly and daily then expect to replace them a bit more often than annually. The two Samsung headsets are comfortable, but if you spend a lot of time on the phone, the people you talk to will have a better time understanding you on the Level U, and the Samsung Gear Circle will fall out of your ears and off your neck when you do almost anything beyond just quietly working at your desk. Either one of them is average or above average on phone sound and microphone, but the microphone on the Level U is noticeably the best of these three.